For all the attention these close-buzzing moms and dads get in the media, helicopter parenting is actually misunderstood. It’s not a set of values. It’s a nervous condition. And one of the chief causes of this widespread malady is the rising cost of being a middle- or upper-middle-class parent in an American city. The most notorious urban helicopter parenting cultures have emerged from the most rapidly gentrifying areas. San Francisco and Brooklyn, two places where the cost of living has spiked especially dramatically, have become well known for their anxious, well-intentioned moms and dads. But they are far from the only cities where gentrification has reverberated onto the playground. Overparenting is easily dismissed as a made-up ailment for rich people with not enough to worry about already. Indeed, lower-middle-class urban parents are likely to have more immediate concerns than whether or not their five-year-old is on the path to Stanford. But evidence continues to mount about the negative impact that overparenting has on children. If this is the parenting style that is setting the tone among successful, educated parents in the United States, it will ultimately be taken for granted as a cultural norm, as an inevitable part of life in upscale urban North America. That’s a problem, first because of its immediate effect on children. According to a recent study by the Canadian Paediatric Society, the gargantuan efforts by parents to control risks for their children has had the blowback effect of creating a generation of sedentary children who only bestir themselves to participate in organized sports a couple of hours a week. But I believe the problem runs deeper. The acceptance of helicopter parenting is, to me, part of a broader process wherein income inequality — the root cause of helicopter parenting, in my view — is coming to be considered part of the natural social order of life in the United States. I come to this debate as an observer with a personal stake. I live in Montreal, in a neighborhood called Mile End, less than 300 miles to the north of Park Slope, Brooklyn, one of America’s most notorious hives of opinionated parenting. Mile End is certainly kin to Park Slope. Many of the same values are shared across the border: limiting one’s negative impact on the environment, nonviolence, the stigmatization of sugar and TV (for kids, anyway — we parents love us some Netflix and artisanal gelato after the kids are asleep). They’re demographically similar too: predominantly white and college-educated. But there’s a difference between Park Slope and Mile End that you’ll notice, first in the neighborhoods’ parks, and then everywhere else: The parents in Mile End are more relaxed. The sidewalks may be jammed with strollers, but the atmosphere is different. Peoples’ choices are not broadcast as loudly. Parents seem less stressed. After-school programming often entails a trip to the park where the parents can hang out and catch up — sometimes even over a beer — while the kids play. As a mother of two young sons, I’ve logged hundreds of hours in my neighborhood’s playgrounds and common spaces, experiencing this firsthand. The Marche des Possibles is a seasonal outdoor market and music venue run by Pop Montreal. It provides a safe space for kids to roam free. I’m also an American citizen; all of my family is in the U.S., and that’s where I went to college after growing up in Montreal. I returned to Montreal in 2009 and had my first kid. I was 27. None of my American friends had had kids yet — certainly not my friends in Brooklyn or our peers in other major American cities where rents were rising even as the economy was beginning to tank, taking with it dreams of career mobility. For these college-educated adults, the idea of having kids and maintaining a middle-class life was still an economic impossibility. In the years since, many of my American friends have started families. I have watched as they have navigated the circumstances they’re faced with — expensive childcare, very brief maternity leave, nonexistent job security. Nowhere does the business of starting a family seem more fraught with social consequence than the urban American beachheads of the young professional class, those neighborhoods flush with Mommy and Me Yoga and organic baby puree. Mile End parents might like to think that they’re just cooler than their American counterparts, or that, as Canadians, they’re innately more sane. But I don’t buy it. As far as their values, the groups are cut from the same cloth. The difference is economic pressure. In major American cities, the rent is too damn high, but so is the cost of childcare, the competition for quality education is fierce, and so is the pressure to succeed in an economy that offers no guarantees. 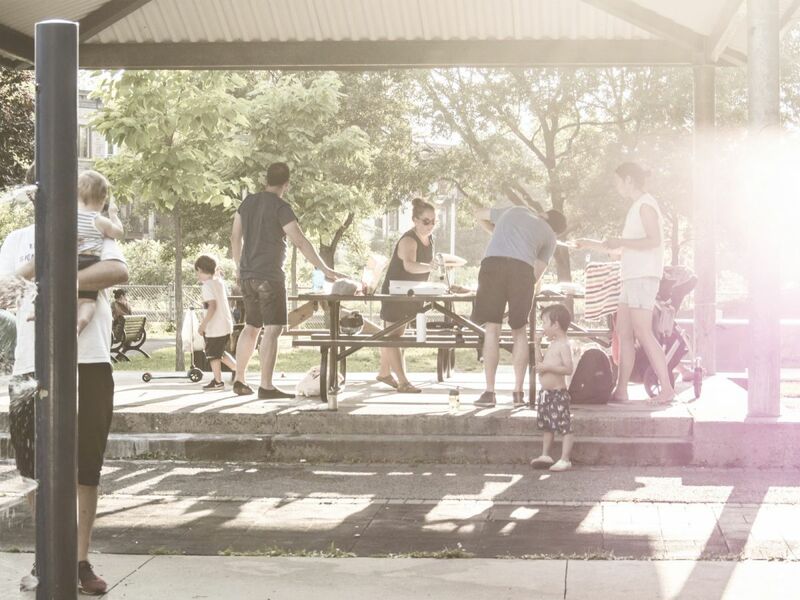 The contrast between my experience as a mother in Mile End and the experiences of my friends raising kids in American cities is dramatic and unidirectional: On average, I have it better than they do. The reason for this is that Mile End parents avail themselves of the most robust set of social benefits for families found anywhere in North America. I stayed home with each of my sons for 10 months after they were born, paid. As a graduate student on an academic stipend, I could afford to pay the fees for two kids in daycare. My American friends have started their own businesses, designed innovative curricula, performed before huge audiences. I am far from the hardest-working among them. Many earn more than I do. And yet as far as life as a parent goes, mine is usually easier. I was able to spend more time with my infants, under less financial pressure. And when I take my kids out into the world, I feel less scrutinized than they do. Mothers in Quebec are entitled to up to a year paid maternity leave (indexed to the income they’ve earned in the preceding year) and can take up to two years off work with a legally binding guarantee that they will not lose their jobs. Fathers are entitled to share a portion of the paid leave as well, and are equally protected from workplace discrimination while they take time off. Quebec’s subsidized universal daycare program costs most parents between $7 and $20 a day. Meanwhile, Quebec’s tenants’ rights law mandates strict limits on rent increases, among a slew of other protections. These benefits translate onto the playground. Compare these two mothers of 18-month-old toddlers: Jen spent the first 10 months of her kid’s life taking care of him at home, relatively free of financial worry since she was getting paid a portion of her salary. For the past eight months she’s been back at work, while her kid is at a daycare that never costs her more than $300 a month. Her rent hasn’t gone up by more than $20 a month in the past five years, and isn’t likely to change. Meanwhile, Lisa in Brooklyn spent two months at home with her baby, and he has been in daycare ever since — at a cost of over $1,200 a month. (Which by the way, makes it one of the more affordable options. Even in lower-rent Philadelphia, full-time daycare will easily run upwards of $1,200 a month.) Her cost of living is subject to change based on what the market can withstand, which in 2015 Brooklyn, appears to be a lot. She is living under the sword of Damocles that hangs over every new parent back at work: Let family life derail your focus on work and you risk losing your job. Can you blame Lisa for being a little more anxious, a bit more of a helicopter mom? Is it so surprising that some of that anxiety would come out in her interactions with her kid? She’s been on an evening-and-weekends schedule with him since he was eight weeks old. She’s already worrying that his developmental milestones are falling short of what’s expected for a kid who gets into the top-shelf preschool. Anyone looking for further evidence that family benefits can contribute to a more relaxed, balanced parenting culture need look no further than the Scandinavian countries where parents are known to let their babies nap in their strollers outdoors in cold weather. Ostensibly it’s to build up tolerance to the cold, but in some contexts — say, while mom and dad are spending a quiet morning at their favorite café — leaving the baby outside (but within view) is a bit like shedding your parent identity for the duration of your latte. The struggle to achieve some kind of balance between work, family and self is a recurring theme in American motherhood, and yet few would allow themselves such an indulgence as a coffee enjoyed while the baby naps in public on the other side of a pane of glass. We decry the overparenting of the urban bourgeoisie, but to blame the parents is to ignore the structural factors of their lives: long hours, low job security, ever-increasing pressure to perform. There are myriad hidden costs to free-market capitalism, and I think that one of them is parents’ ability to relax around their kids for long enough to start taking their family time for granted. 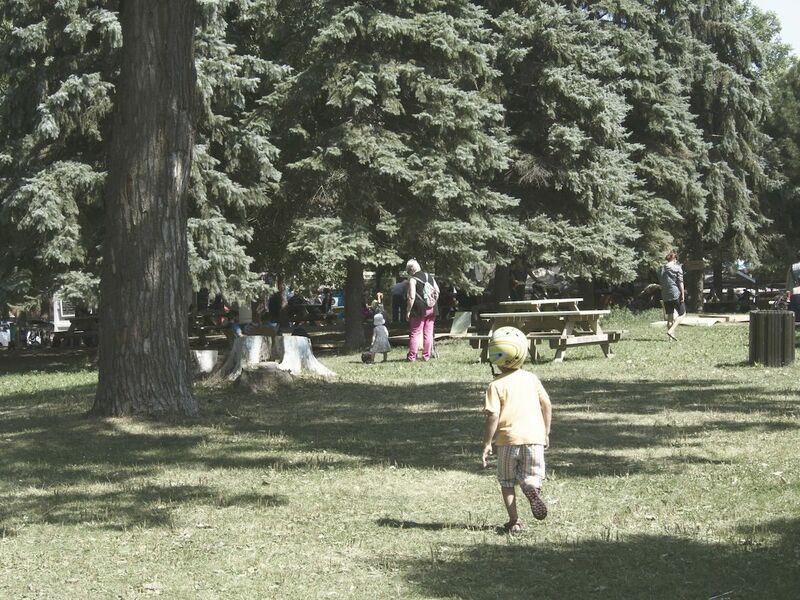 Holly Gibbs, an instructor and researcher on work and family policy at McMaster University in Hamilton, Ontario, notes that in areas where parents work long hours and where school admissions are competitive, fewer kids spend time in parks and playgrounds because parents have scheduled programming for their kids during their free time. “Where parents are working more, there is a pressure to put your kids in tons of programming as a way of showing that you still care about your kids … . Children are the ‘new investments’ in middle-class families,” wrote Gibbs in an email. Quebec is the only model we have in North America for a society with a full slate of family benefits in place. If it feels like the United States is a world away from Quebec in this respect, that’s because it is. As John Oliver recently noted, the United States has among the most paltry paid maternity leave affordances on earth. The Family Medical Leave Act grants parents up to three months unpaid maternity leave, but not all employers or employees fall under FMLA’s mandate, and many parents can’t afford to relinquish their income. Mothers can also apply for short-term disability insurance, which provides a percentage of salary for a certain length of time following childbirth, typically six weeks. Meanwhile in Quebec, parents have the option to split parental leave between them for up to 32 weeks. And if a mother opts to take the entire leave herself, Quebec fathers are still entitled to a paternity leave of five weeks. A recent studyof Quebec families by the Council on Contemporary Families indicated that fathers who took their five-week paternity leave spent 23 percent more time engaged in “household work” after they had returned to work. Quebec’s parental leave policies weren’t born out of a straightforward initiative to help working mothers; it was partly a nation-building enterprise. In the 1960s and ’70s, Quebec’s Quiet Revolution led to the secularization of many medical and educational institutions that had previously been run by the Catholic Church. The economy accelerated, but the birthrate plummeted. Quebec’s independence movement that ran the government during that period saw a pressing need to spur population growth if they were going to have a shot at nationhood. Pierre Fortin, an economist at the University of Quebec in Montreal and an authority on Quebec’s family benefits, says that the main impetus behind subsidized daycare is to provide equal opportunity for children during the first years of life, and to “help parents reconcile their parental and professional duties.” According to Fortin, Quebec plans to spend $2.4 billion (CAD) on subsidized daycare for the 2014-2015 fiscal year, which represents $10,000 per child enrolled, and 0.6 percent of Quebec’s gross provincial product. Before the naysayers beat me to it, I must acknowledge that like any social program with huge oversight and enrollment, Quebec’s universal daycare program isn’t perfect. Supply still trails demand, and the supply gap is filled by private daycares that can charge whatever they want. However, the government still offers a monthly refund, direct-deposited into your bank account, for a portion of families’ outlay for private daycare, indexed to the household’s income. All parents have to do is fill out some paperwork. I consider myself lucky to have found a public daycare in my neighborhood where my kids are happy. I took the advice of a few daycare veterans and was aggressive in following up at places where I was on the waiting list, going so far as to approach the woman who runs our daycare on the street uninvited. I’m sure she gets that a lot; she seemed completely unperturbed. Quebec parents are in the fortunate position to be able to demand that their government improve on a functional existing program, and they do so, loudly and often. The fact is that affordable childcare is something most Quebeckers take for granted, and its effects have changed the province. Fortin’s research indicates that in 2008, 69,700 more mothers held jobs than would have been able to without subsidized daycare — which translates to an increase in 3.7 percent employment among women, or 1.78 percent in Quebec overall. “These orders of magnitude are quite significant,” noted Fortin. “Does this make or allow families to see their kids less as investments? … Perhaps. The understanding then that most kids are in comparable daycare with comparable costs reduces the competitiveness that would come from investing in ‘the best education for your child to compete’ right from the point that they are a baby,” writes Gibbs. In the United States, most childcare is subject to the same market fluctuations as real estate. In 2013, Child Care Aware of America released a report indicating that a year’s full-time daycare in 31 states and D.C. cost more than a year of tuition at a four-year public college in that state. And, as the Boston Globe put it in its coverage of the report, “entrusting your little one to a caregiver isn’t exactly the time to bargain-hunt.” In areas that are undergoing rapid gentrification, the costs can be staggering even for the well-to-do. In 2011, SFGate.com reported that the cost of childcare in the Bay Area had risen 21 percent in the previous three years. When extreme social and economic stratification begins during early-childhood education, it’s hardly surprising that it continues into grade school. Jessie Friedman, a music teacher in Nashville and mother of a three-year-old son, is considering homeschooling when her son reaches school age, because the alternatives — struggling public schools or unaffordable private schools — are so unappealing. Friedman believes that the cost of living in gentrifying Nashville affects the number of kids people choose to have. “It definitely adds stress, and creates less time to spend with the kids,” she says. Parents who hope to get their kids into competitive elementary schools often enroll them in after-school academic enrichment programs like Kumon, which offers twice-weekly tutoring in math and reading at locations around the world. Although prices vary, Kumon typically charges an enrollment fee of $70 per child, and between $80 and $120 per subject per month. One-on-one math tutors in Manhattan cost $20-$50 an hour. Working-class families are priced out of participation, and for many middle-class families who feel pressure to make it work financially, it’s just another straw on the camel’s back, another nudge toward work-related stress. Parents who want their children to have access to the best schools in the country are on their own; the state isn’t going to help them get there for free. This might seem perfectly reasonable to many Americans, but the effect that I observe borders on the perverse: Parents become responsible for the development and marketing of their children to elite institutions. The kids — their aptitudes, personalities, perspectives — become commodities. Quebec’s regulations around rent are the most stringent in Canada, and Quebec has the highest percentage of renters in the nation: 38 percent, according to Statistics Canada. Landlords are permitted to raise the rent once a year, but unless significant renovations have been done, they must adhere to a government-approved increase, typically pegged to inflation. It rarely amounts to more than a $10 or $20 increase in one’s monthly rental payment each year. Increases are also permitted when a new tenant moves in, but landlords must disclose the lowest amount of rent they charged in the previous year to the previous tenant. If the new tenant feels the increase is too high, they can contest it with the provincial rental board (and they often win). Gentrification is as much a fact of life in Montreal as it is in Brooklyn and other American cities. Mile End, in particular, has seen a reduction in the number of rental units over the past 10 years, as landlords have converted multi-unit rentals into single-family homes and condos. Average rent for two-bedroom apartments increased more than 16 percent from 2012 to 2013 in Mile End, from $807 to $938. But the controls in place offer a measure of stability foreign to families treading water in gentrifying U.S. cities. In New Orleans, the average household spends 41 percent of their monthly income on rent. The U.S. Census defines households who spend more than 30 percent of their monthly income on rent as “housing cost burdened.” Over the last five years, Nashville has had among the fastest-rising rents in the nation, and 2013 Census data indicated that over half of Nashville-area residents were cost-burdened. San Francisco’s Rent Board issues an annual rent increase limit, indexed to the Consumer Price Index. But the Board’s guidelines appear to serve as little more than a suggestion. This year’s average rent in San Francisco is 16 percent higher than last year, according to real estate website Zillow. Some neighborhoods have seen rental increases as high as nearly 30 percent year over year. In Brooklyn, where a political party called The Rent Is Too Damn High has its headquarters (a party whose mayoral candidate won over 40,000 votes in 2010), the median rent in April 2015 was $2,961, 5.6 percent higher than the previous year. It set a new record. In Manhattan, April marked the 41st month out of the previous 48 that rents have increased year over year. For most families trying to save for the future, the only way to absorb these costs is to work harder. Add the cost of childcare and enrichment programs, and relaxed family time becomes a luxury good. Parents are compelled to make that time “count.” With the specter of school admissions looming, it’s no wonder that many parents micromanage their kids’ academic and social lives in the brief time that they can afford to spend with them. Helicopter parents are easy targets for parody because their anxieties are plainly visible to people around them. With their public performance of achievement and exertion, they turn the intimate practice of parenting into a spectator sport. There’s something icky about that, but they deserve sympathy. They’re not helicoptering for the fun of it. Those who can afford not to — like my friends and neighbors in Mile End, and the parents in Copenhagen having brunch while their baby naps outside — direct their energies elsewhere. Put another way, when you have more time with your kids, it’s easier to forgive yourself for the routine mishaps of family life: accidents, failures, disappointments, boredom. Those experiences enrich kids’ lives in ways that tutoring never will. But let’s not blame helicopter parents for hiring tutors and overscheduling their kids. Let’s look at what’s driving them to do so. A painful irony underlying this epidemic of anxiety among well-off urban families is revealed when we ask ourselves what we are training our children for. Is this the version of success that we hope to see them recreate? Have we come to accept anxiety as a natural component of a successful life? Is this what they have to look forward to? I suspect that most parents would insist no, what they want for their children is more stability, less stress, more financial security. But given the ever-widening gap between the rich and poor, how likely is it, statistically speaking, that their kids will ascend into the super-rich realm where private school tuition and enrichment programs are carried without a care? As for the kids who do progress through top-tier schools, culminating in a high-powered job in adulthood, what will all that grueling competition earn them? Once all the tests and interviews have been passed, what is the actual trophy of this achievement? Kids who are hoping for a deliverance from anxiety are likely to be disappointed, if today’s American adulthood is any indication. This will be the fruit of the middle-class American dream. Will it have been worth it?